A panel of graduate students and three faculty leaders of the International Climate Change Policy-Morocco COP22 Study Abroad program will discuss their experience and takeaways from the recent U.N. international climate negotiations gathering in Marrakech, Morocco in November 2016, to be followed by Q & A. Professors Ellen Anderson, Melissa Hortman, and Gabe Chan along with several graduate students will speak and take questions. 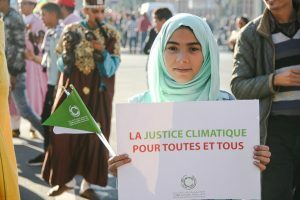 Hear first-hand the inside story from the U.N. climate talks in Marrakech from students and faculty-study abroad. Bring your lunch and join the discussion on the latest global climate negotiations–and what it means for the U.S. and MN. How does the U.S. election affect international cooperation on climate change? Find out at this student-faculty panel discussion. Brown bag: bring your lunch; beverages and cookies will be provided.